Osoyoos is a winery in the very south end of the Okanagan Valley producing somewhat serious red wine modeled on Bordeaux. It’s a joint French/Canadian venture designed to deliver classic reds wine for connoisseurs cellars and dinner tables. 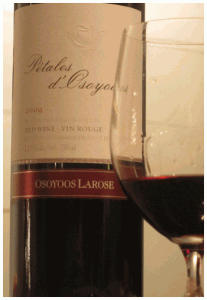 However, in keeping with the Bordeaux custom, Osoyoos offers a second, less serious, and ready to drink sooner, red under the name of Petales. It’s quite dry, semi-rich and would be perfect for a smart, linen tablecloth dinner – with roasted lamb or beef. Or as a gift for wine enthusiasts on you list. Pascal Madevon, is not only the brilliant winemaker at Osoyoos, but a charming salesman so expect to see his creations on most good wine list across the country.